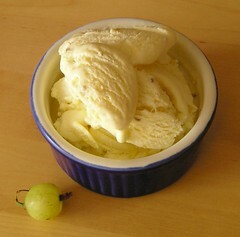 Gooseberry and elderflower ice cream - Do You Know The Muffin Man? Notes: Made using Swedish elderberry flower syrup bought at Ikea. Flavour is tart and floral, almost like cheesecake. Lawson says, “Eat and weep.” I wouldn't go that far.